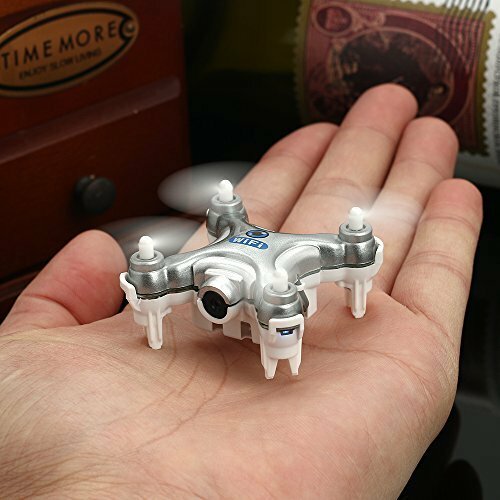 Being the Smallest quadcopter in the world (at the time this article was written) we can say it’s pretty small. 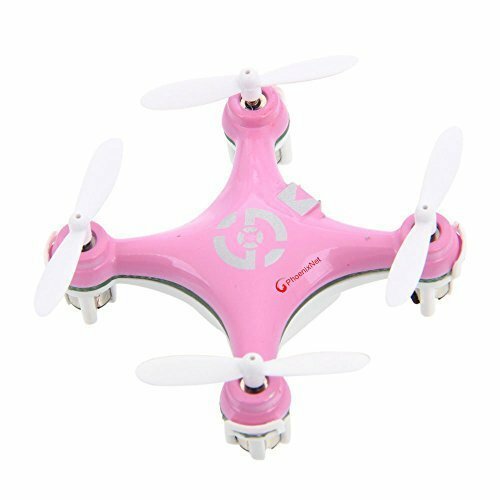 Although Cheerson has released an even smaller drone in 2017 called the Cheerson CX Stars! Why pick the Cheerson before the CX Stars? I would say that being a little bigger, it’s more durable and you can also fly it outside. As much as the design goes, it has a really compact frame, similar to the design of a mini Phantom 3 from DJI, as Flying Ryan RC said in one of his videos. Oh, and the most amazing thing about it: It can do very tight Flips! I surprised each of my friends with this quad. They didn’t even see it coming. When I started flipping with some little toy that doesn’t even look like could fly… let’s just say they were impressed. It’s only $15 on Amazon.com and totally worth buying even if just for impressing your friends. Okay, I see you are not convinced yet. An interesting feature is the fact that it has 4 lights on each motor that enable you to see it in dark and also detect the orientation better for flying. In this sense, I do wish they did different colored props, for front and back, because it would make it easier for beginners to keep direction. This guy is just as little as the quad itself, just perfect to fit in your bag and have fun wherever you go. In the image above I explain the function of each stick, so you know how things go before you hit the first wall in your way. If you buy a quadcopter/drone, learn how to use it before flying it close to other people! 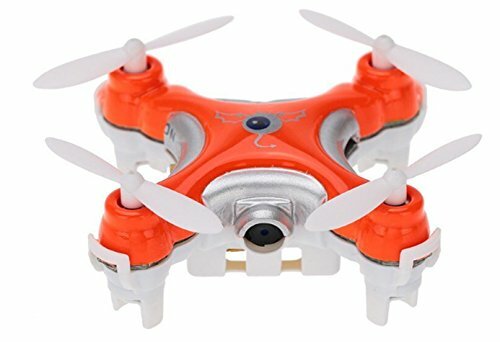 If you notice the quadcopter drift in a speciffic direction, use the trimming buttons shown in the image above and click the opposite direction button until it gets stable. If it's your first time and you loose control or hit something, just move the left stick in the bottom position and the quad will stop. This is the perfect solution to avoid problems like the toy flying away(if outside) or hitting something and keep spinning while inside. By pressing on the right stick you'll activate "the flip mode"
You can change these by pressing on the left control stick . When you hear one beep, that means you’re now in beginner mode and the drone will fly slowly. If it’s two beeps you’ll be in intermediate mode, a little faster. And, of course, 3 beeps means sport mode which will make it fly really fast. You'll hear a beep right after pressing it. After that, you can move the right stick in any direction and the quad will make a flip by itself and then stabilize on its own. To flip again you need to press the button again and so on. You can re-calibrate the accelerometer by pressing the left stick in the bottom left position and the right one in the top left position at the same time. It takes about 20- 30 min to fully charge the battery and you’ll probably get like 5- 6 min out of it ( I get 4.5 min if I fly faster) The battery is encased in the quadcopter, so you can’t change it after a flight. You’ll need to wait and recharge it before you fly again, or buy two drones and have even more fun! When it comes to the range it can fly… it’s about 50m at most, if not less. But it’s not like you need more, after a few meters you won’t even be able to see this little fella. First of all, make sure you buy an extra set of props with you quad and maybe even a guard protection. Check the props if they’re spinning properly. Sometimes hair can get stuck in there, but it can be easily get rid of by removing the propellers. Speaking of that, you can remove the propellers by carefully applying upward force to each of them. Don’t twist or break them. Also, make sure when replacing propellers to do it correctly. Notice that the props are spinning in the directions shown in the image on the left, so you must put each prop on its right spot. Cheerson recently released a camera version of the Cx10 that work just as great. I’m not a big fan of cameras in such little devices because it drains the battery quicker. 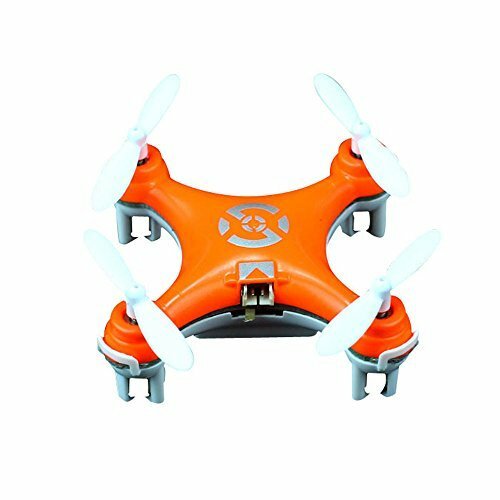 These being said, here are a few advantages and disadvantages of this small quadcopter, the Cheerson CX 10. Overall, I think this is very good for beginners, just make sure you first learn how to control it properly. A great drone for bigger children (it’s not that easy to control though). Makes for a great passing time partner, even for adults, as the battery can be charged pretty quick. Very cheap, small, perfect for making it a gift, or playing with in the office, on a break. Are you older than 10? No worries, This drone is fun even for adults! And it's pretty impressive when you actually see something of this size can actually fly.